Using an ergonomic office chair is one of the best ways to prevent workplace-related injuries for anyone required to work behind a desk for many hours. While conventional seating may seem adequate, studies and research have proven that unless seating provides specific, necessary support, health-related issues are likely at some time. For those who work at a desk and are suffering from lower back pain, numbness in the hands or feet, neck pain, pinched nerves, carpal tunnel syndrome, and many other conditions, poor seating is often the cause which is where ergonomic chairs come to the rescue. Having a great office chair allows for a job to be done in comfort, without the eventual complaints inherent with prolonged sitting. Scientifically designed to fit each individual user, the benefit from using correctly adjusted chairs and desks can make the difference between debilitating pain and a pain-free, productive work experience. Of course, having an ergonomic office chair is only part of the equation; understanding how to adjust that chair is the other, as incorrectly adjusted chairs do no good. So here are the main settings involved in properly adjusting any ergonomic seating. Seat Height and Leg – The highest point of a seat should be just below knee cap level; when seated, with feet on the floor, it should create the correct hip-knee-floor angles necessary for good posture. Thigh and Calf – With a seat adjusted to the right height, there should be room to slide fingers under the thigh at the very edge of the seat. Without this, either the seat must be lowered or the feet should be placed on a footrest to provide an adequate angle from hip to knee to the floor and reduce pressure at the back of the thigh. When seated all the way back against the backrest, there should be room between the edge of the seat and the back of the calves; the backrest should be otherwise moved forward. If that is not possible, use a lumbar support insert or a different chair with a shorter seat may be necessary. Armrest and Elbow – Having elbow support is extremely important for reducing shoulder and neck strain. Armrests should be adjusted so that when the arms are rested flat on them, and the hands are on the desk, the arm is at a 90-degree angle and the back is straight. If the elbow angle is different, seat height may need to be raised or lowered. If the desk is too high and the desk height is difficult to adjust, a keyboard tray may help. Lower Back – When seated against the chair back, there should be a back cushion that keeps the lower back arched just slightly forward. Avoiding slumping and keeping the back and bottom pushed up against the lower back support will promote good posture and alleviate any stress on the lower back and lumbar spine over time. Computer Eye Level – To maintain a correct seating position, it is important to properly position computer monitors. Holding the head in a natural position and opening the eyes in a natural position, gaze should fall to the center of a monitor screen. Any higher or lower can cause neck strain and monitors should be boosted or desks lowered to be correctly position a monitor for comfortable viewing. Although correct adjustment of an ergonomic chair can take time, the comfort provided is time well spent. If it is difficult to adjust a chair as it should be, it may not be the best choice for that person and another chair should be chosen. The most versatile, ergonomic workstations include adjustable desks as well; if that is not possible, a great ergonomic office chair can make a huge difference in employee comfort, health and productivity! 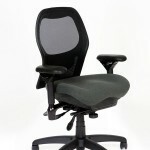 Find the Best Ergonomic Office Chair at the Ergonomic Chairs Store! 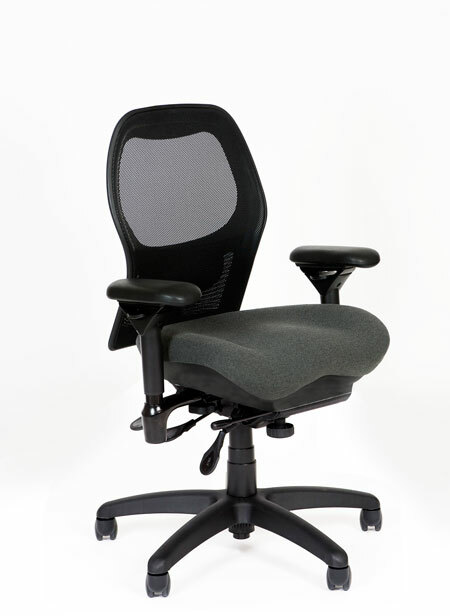 Need to find a great ergonomic office chair? Contact the Ergonomic Chairs Store for help in finding the right chair to fit your needs! Discover The Many Ergonomic Chair Styles! Copyright 2003-2018 Ergonomic Chairs Store. All Rights Reserved.